Patriot Gold Corp., a developing gold and silver exploration and production company, today announced the results from a 15 hole drilling program and metallurgical results obtained from heap leach cyanidation (column leach) testwork on a mineralized material low grade bulk sample from its Moss Mine Gold-Silver project, located in Mohave County, Arizona. 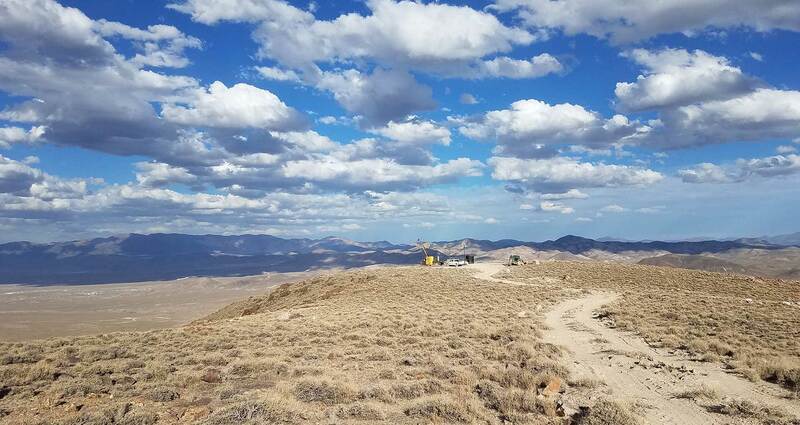 "The on-going progress and results from our Moss site continue to strengthen and support our belief that this Patriot Gold investment has the potential in the long-term to create significant revenues and profitability," said Bob Coale, CEO of Patriot Gold. "With continued positive results from the drilling program and promising above average results from the heap leach test work done by McClelland Laboratories, we continue to gain increasing confidence in the belief that the Moss project will ultimately create enhanced value for our shareholders." Drill holes AR-204, 205, 211 and 212 were drilled in the western section of the deposit known as the Western Extension. The holes tested near surface quartz-carbonate stockwork zones that were open to the south of the evaluated mineral resource. Multiple zones of stockwork veining were encountered in AR-204, 205 and 211 all within a maximum depth of 150 meters from the surface. The results substantiate the potential of the widespread stockwork mineralization to continue to the south beyond the current limit of the mineral resource estimate. The other eleven exploration drill holes were drilled in the central and eastern part of the Moss deposit. Eight of the holes were deep tests of the down dip extension of the Moss mineralized zone. The results from AR-195, 197, 199, 200 and 206 demonstrate that the strong development of quartz-carbonate veins, breccias and stockworks continue at depth to at least 200 meters vertically from surface. In addition, two shallow holes (AR-198 and 207) tested the Moss mineralization on two sections containing relatively widely-spaced drill holes. AR-198 cut a nearly 20 meter wide zone of mineralized veining while assays are awaited for the 3.2 meter quartz vein encountered in AR-207. Testing on samples was done by an independent ISO 9001:2008 lab based in Nevada. Final results for AR-196, 207, 208, 210 and 212 will be reported once received. The company reported that McClelland Laboratories, Inc., specialists in heap leach processing, completed metallurgical test work on the low grade mineralized material from the Moss Mine Gold-Silver Project. The primary focus was to determine if there was a relationship between grade and recovery for the higher grade mineralized material and the lower grade mineralized material. Metallurgical lab test results indicate that lower grade mineralized material was readily amenable to agglomeration - heap leach cyanidation treatment at the 95% -1/4" crush size with respect to gold (Au) recovery. The sample tested was a bulk sample of mineralized rock, characteristic of the lower grade material that is expected during Pilot Plant Operations. The sample was prepared using a jaw/cone crusher circuit to 95%-3/4". The crushed material was then passed twice through a modified rolls crusher located in Phoenix, Arizona. The low grade material can be leached for shorter times compared to the high grade material, as indicated in the Amended Preliminary Economic Assessment dated June 18, 2013. 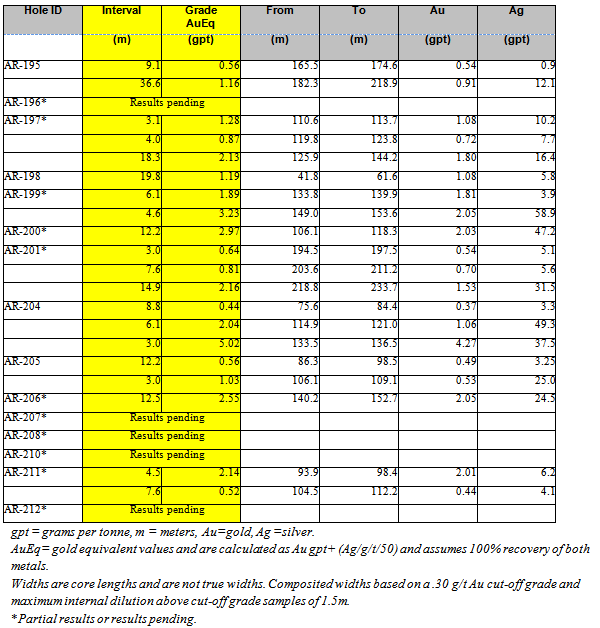 Column test gold recoveries at a 73 day leach time on the low grade material, processed 2 x thru rolls, 95%-�" inch were 82.7% for gold (Au) and 36% for silver (Ag) whereas recoveries at a 112 day leach time on the high grade material, processed 2 x thru rolls, 95%-� inch were 84.6% for gold (Au) and 76.6% for silver (Ag). NaCN consumption was lower for the low grade mineralized material vs. the high grade mineralized material. As well, a relatively low quantity of cement (4 lb/ton ore) was added during agglomeration pre-treatment. Leached agglomerated samples were not significantly degraded during leaching and remained strong and stable. Geotechnical characterization ("load/permeability" type testing) will be required to confirm permeability of the agglomerates under planned commercial heap stack heights.